All sources of energy to support human activity have implications for health. We, as a society, need to choose how we harvest energy so that we use the ones with the least overall adverse impacts on health. 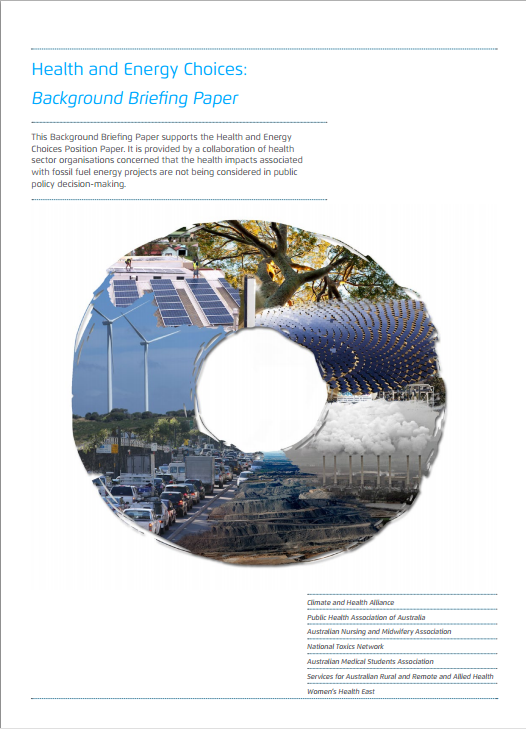 These papers on Health and Energy Choices seek to open this discussion for Australia, and begin a national conversation about making energy choices that benefit us now and into the future. This Position Paper outlines the concerns and recommendations for action to reduce risks to health from current energy choices. It has been produced by a collaboration of health sector organisations concerned that the health impacts Australia’s energy choices are not being considered in public policy decision-making. An accompanying Background Paper provides an overview of evidence with regard to the risks to human health and wellbeing associated with fossil fuel energy resources as well as their alternatives.